House cleaning, Carmel, Indiana, knows that you’ve got your hands full. Your little munchkins are not too young to understand that, too. 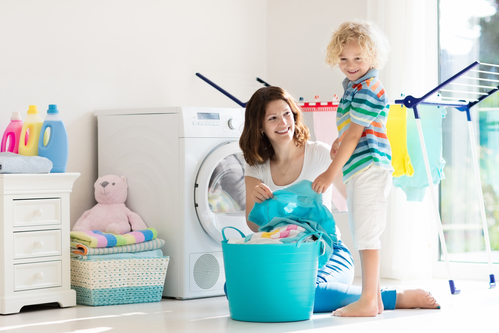 One convenient alternative to doing all the cleaning by yourself is hiring local house cleaning services from time to time, but don’t forget that the little ones can help out as well. All you need to do to get them to help out is make cleaning fun for them! With our little tips and trick, you’ll have no problem getting your kids to help out, as they’ll be having fun along the way! One way to go about this is to hide treats at strategic points, such as dollar bills under a pile of toys or candy under a heap of clothes. Let the children know they’re in for a treat for pitching in, but only once they do the cleaning. If you hide the treats cunningly enough, not only will they do a thorough job, but be swift to do it, too. These modest incentives teach kids that doing their fair share pays off. Not unlike adults, children love competing and relish winning, so a contest works well for kids of all ages. The grand prize, like enjoying a day off on the next cleaning day, or getting to choose what to have for dinner, should go to whomever works the hardest. A competition is also a way to teach kids not to begrudge others their success. Play the kids’ favorite music, using each song as a timeframe for getting a single cleaning chore done. Whoever manages to complete the assigned task properly and in time, gets to sit the next song out. One foolproof way to get your kids to be more enthusiastic about cleaning is to make them feel important by treating them as your equals. The mere fact that they are being entrusted with a responsibility usually reserved for grown-ups will boost their confidence and increase their sense of pride. One way to do make everything more formal is to give each kid a bucket with their own cleaning supplies and tools. If you feel like it, you can even give the kids name tags and similar-looking outfits resembling uniforms worn by professional cleaners who provide local house cleaning services. Some kids might enjoy folding clothes while others prefer sweeping the floor. Trading a job they don’t like for a job they like better can feel like a small victory to a child. No doubt your kids can rise up to the challenge of helping with the cleaning, but you have to work your way through it, have enough patience, time and energy to make the process fun for them. In other words, if you’re in a jam, you need a reliable alternative in the form of superior local house cleaning services! We take the deluxe part most seriously and offer a 100% satisfaction guarantee. Get in touch with DeluxeMaid today and let us bring luxury cleaning into your home!